Comedies and spy thrillers aren’t inherently incompatible but it takes a deft hand and a well-honed script to successfully merge the two and The Spy Who Dumped Me has neither. One obvious failing is that it spends too much time on a boring, routine espionage story that is less exciting than a bad James Bond parody. Spy movies should be suspenseful, exciting, and unpredictable. When a film – even a comedy – fails to incorporate any of these qualities, the experience of watching it turns into an exercise in tedium. Labeling something as “humorous” and hiring actors known for their ability to tickle the funny bone doesn’t excuse a dumb, overlong screenplay that works neither as a comedy nor a thriller. The Spy Who Dumped Me is at its best when it’s not doing anything spy or action-related. Early in the film, for example, during the “getting to know you” scenes that introduce long-time best friends Audrey (Kunis) and Morgan (McKinnon), there’s a sense of camaraderie. Later in the proceedings, Morgan has a couple of phone calls with her parents in New Jersey (played with deadpan flair by Paul Reiser and Jane Curtain) that are far better than the material surrounding them. Whenever the movie strays into action territory, even if it’s trying to be satirical, it quickly loses its way. When we first meet Audrey, she’s having a bad time after being dumped in a text by her now ex-boyfriend, Drew (Justin Theroux). Morgan commiserates with her and the two share some girl-bonding moments. That’s when Drew shows up, somewhat the worse for wear. He divulges some information to Audrey in a rapid exposition dump: (1) he’s a spy, (2) he split with her because he was worried about her safety, and (3) he’s in possession of a super-secret McGuffin that needs to be delivered to the right people in the unlikely event of his death. In a development that will surprise no one, no sooner has he said this than he’s shot by a naked man with an indecipherable accent. It falls to Audrey and Morgan to complete his mission, which requires a trip to Vienna while being pursued by a dashing MI6 agent, Sebastian (Sam Heughan) and an angry ex-Olympic gymnast turned hitwoman (Ivanna Sakhno). The only people who won’t guess every narrative twist of The Spy Who Dumped Me are those who have never seen a spy movie. Although the bar is admittedly lower for movies of this sort than for more serious efforts, if a film is going to devote more than 50% of its running time to plot, the results need to be at least moderately interesting. Picking through crumbs to find a few tasty morsels or looking for “silver linings” isn’t how I want to spend a couple of hours. Speaking of which, why does this movie have to be nearly two hours long?? Going in, I had high hopes because both leads have shown the capability to captivate. Unfortunately, at least based on the evidence at hand, Susanna Fogel hasn’t shown herself to be a better alternative to Paul Feig. 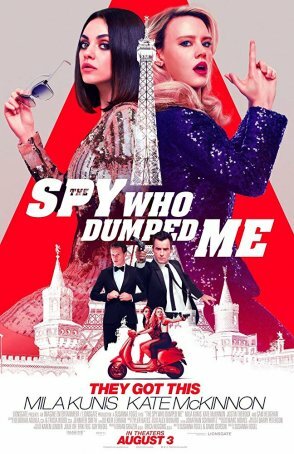 The most clever thing about The Spy Who Dumped Me is the title, and that’s not saying much.